I place a large share of the blame on the doctor who implanted 7 eggs...7 fertilized eggs into one woman's body! This is unconscionable! I have am no doctor, but even I know this is wrong wrong wrong. From what I have read, for a healthy woman under 35, the doctor's ethical standards are 2 fertilized eggs. Not only did he do over 3 times this, but he had also implanted this woman 4 or 5 other times. WTF?! Then...a woman who already has 6 children, at least 2 of whom are special needs, who has no job, who has aspirations of continuing education but has not completed anything, who has no partner, and who depends pretty much on welfare (sorry, food stamps) and her parents wants more children. And this doctor says ok? I hope he loses his license post haste! This sets the women's rights movement back...because of this woman, limitations on reproductive rights are now being bandied around. While I am all for regulation, I am not for the government putting any limitations to my uterus. Doctors are supposed to be bound by ethical standards. This doctor obviously did not choose to adhere to them. This whole situation is a tragedy, but it will be a larger tragedy if it causes laws limiting a woman's rights to be enacted. Don't even get me started on her faulty religious reasoning. I feel so torn about this whole thing...these kids are already here, fighting to survive; they did not choose to come into this world to a mother who is an insane cuckoopants. Do we let them falter because the mother has no insurance and cannot pay? Do we impose further on an economy that is itself faltering, thus risking funding many programs that will help a larger group of people? 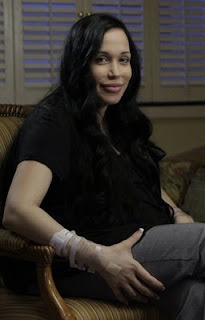 (already, I believe the octuplets' medical care is over 1M$, which is no small sum in California's economy as it stands) Then there is their ongoing care, for which the mother cannot pay, and the food stamps and other programs that she will continue to use because she has no job and 14 kids to raise. The whole situation makes me so sick. And sad that this woman put her children, all 14 of them, at such a risk...a woman's body was not meant to carry 8 children; what if she had died during pregnancy/birth? She would have left her other 6 kids motherless...and carrying 8 in one belly puts all those little ones at risk for all kinds of birth defects. I do hope they survive and thrive and are without problems...but I hope other doctors are more ethical going forward.